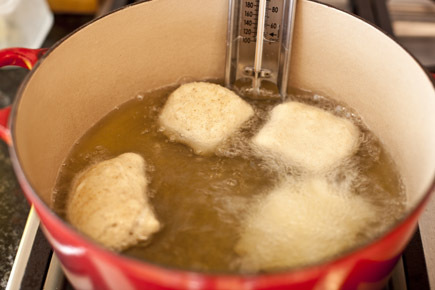 This week is Chanukah and it is all about frying our food, which brings me great joy. I am constantly trying to come up with something new to add to our menu of latkes, jelly doughnuts and all the other traditional fare. 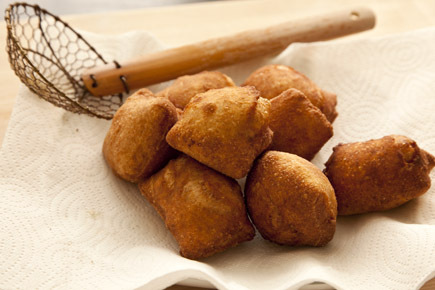 These savory doughnuts were inspired by the fried pizzas I had in Naples. We ate them as snacks during the day, to tide us over to the next pizza. Most of the pizzarias sold them outside their front doors to people waiting in long lines or folks on the run. 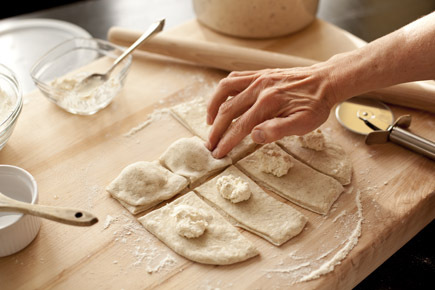 Pizza dough stuffed with ricotta and deep friend; simple, but perfect. 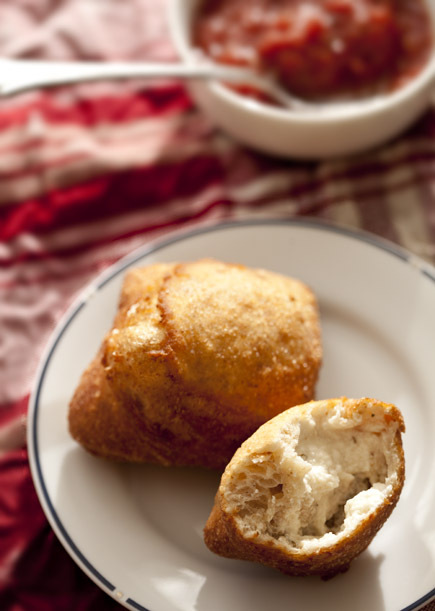 My boys love them stuffed with a variety of fillings, so use your imagination and create your own savory doughnuts. Bring a pot of oil to 370°F on a Candy Thermometer. The oil should be about 3 inches deep and not come up more than halfway up the side of the pot. Mix together the ricotta, nutmeg, oregano, salt and pepper. 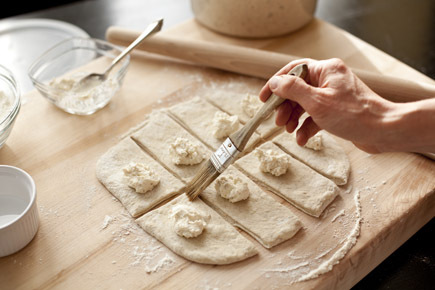 Put about a tablespoon of the filling onto the dough, placing it so that you can easily close the dough around it. Brush the edge of the dough with water. Press the dough closed around the filling. Making sure that the dough is sealed well, so the filling won’t come out while it is frying. 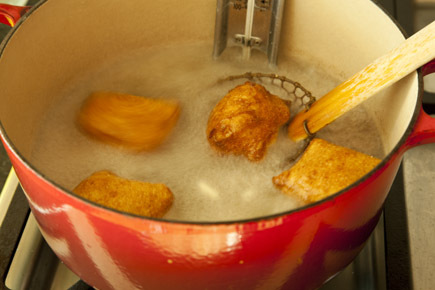 Place the doughnuts in the hot oil for about 2 minutes, or until they are golden brown. Put only a few doughnuts in the oil at a time, they should not be crowded or they will not fry evenly. Flip the doughnuts over and fry the second side for another 2 minutes. Make sure your oil is staying around 370°F. When the doughnuts are done frying, use a basket skimmer to remove them from the oil and place them on paper towels to drain the excess oil. Serve with the tomato sauce or pesto. these look just so yummmmmmmy! I may have to make them tonight! I wish both of you and your families the most wonderful end of year celebration times! PS: forgot to tell you I love the (relatively) new banner. 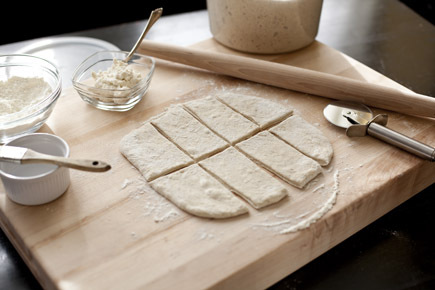 We found that the flatbreads are easier to do with GF than breads that need to develop loft. Our second book has even more of these– have you seen the web versions (there are a few here on the site). I miss France– so great to see you last summer! I made pizza frita for Chanukah already. But, I stuffed it with sauce and cheese. This sounds even better. These look wonderful. Bet you could mix some chopped broccoli or spinach into the filling. Blessings to you and yours and Happy Chanuka. I love the idea of adding some veggies. I served the broccoli on the side, but next time I’ll put it right inside! Before the year ends, I must complement you both on how you respond to questions on your website. I was at a different website where the person had over 800 comments on a recipe. She didn’t answer any of the questions, which was frustrating to people. I know that’s a lot of comments, but a lot of the questions were repeats that went unanswered. I know I feel happy using your books, feeling like I have a relationship with you guys because you have answered my (many) questions over the years. It’s helped me grow tremendously as a baker. Thank you so much, Zoe! Coming from you, the complement means even more. Thanks for being such a great teacher! The best to you and Jeff in 2012! I was so inspired by your stuffed naan recipe that I had to try it. Unfortunately, the refrigerated dough had a lot of resistance so I was not able to roll it out properly. I have to admit that I am more a cook than a baker and haven’t figured out a way to deal with the resistance in dough. Please advise. Thanks. Shirley: Let the dough rest between multiple attempts to stretch it. Which book are you working from (which recipe/page number)? Did you see the post I recently did on Stuffed Naan? http://artisanbreadinfive.com/2011/11/29/stuffed-naan It may be helpful to see the process for rolling out the dough. Ack! Of course the first recipe I tried from your new book was the Neopolitan style pizza on pg. 72 because I only had bleached flour. I halved the recipe and the dough was soup! I realized right away that there was some mistake. I should have checked the error page first! Anyways, I don’t have enough flour to start over so I added flour until it resembled the other doughs I’ve made from your book. Can this pizza be saved? Do I need to do anything else? Yes, the dough can be salvaged. You did exactly what we would have recommended. Now you need to let the dough sit so the flour can absorb the excess water. I’m inspired! Having no experience frying, is this as easy as it appears? What’s the #1 beginners error I should watch out for? We just had them for lunch….fabulous! So glad you tried them! Devouring, so to speak, Artisian Bread in 5 on Kindle. Just came to the Oatmeal Bread recipe and see that it has milk as an ingredient. I use raw milk and wonder if the milk should be scalded first. We didn’t test any of the recipes with raw milk, so I am not sure how it will effect the results. If you try it please let us know so we can others. The garlic won’t spread on the loaf, it just roasts and then you can spread it on the bread when it is baked. If the oil/ spice mixture seems like it is rolling off the dough, then don’t put it all on, you can save it for another loaf. Never seen doughnuts like this before. I’ll have to give them a go! To Sharon Zee’s question on scalding raw milk: I would think that for safety it SHOULD be scalded. Raw milk is not pasteurized, so it can have bacteria in it (such as tuberculosis – unfortunately I know that one from personal experience). If you put it in with warm water and leave it out for two hours to rise, the bacteria has time and perfect conditions to grow. Of course, in a perfect world, baking the bread should kill anything that grew, but to be doubly safe (in case something ends up undercooked sometime) I think scalding would be the wisest/safest course – especially if you cook for the very young, elderly, or those with immunity problems. Culinarily, raw milk should act like store milk, except that the cream tends to separate out, and the fat levels per glass can vary greatly, which could affect texture – but in most recipes it should work pretty much the same. Hope that helps. As far as I can tell from my research since I asked the question, raw milk (healthy and wholesome), needs to be scalded to inactivate an enzyme in milk that otherwise causes problems for the yeast. Milk from the store does not need to be scalded though bread recipes, though not the one I asked about, persist in saying scald the milk first. Old habits die hard! Made my first loaves with your master recipe yesterday. They were fabulous. I searched your posts to try to find mini hot dogs in blankets, but couldn’t find anything. Have you done that? We bought some on our travels long ago, and took them out of the freezer last night. They were mini cocktail hot dogs in puff pastry. I remember thinking “I can do better.” A friend of mine also would love to have Hebrew National mini hot dogs in blankets, but they aren’t sold in this part of the country. Have you done a post like this? If not, this is a good time to try it before Super Bowl Sunday. I’m thinking maybe cutting hot dogs in thirds and somehow using AB5 Master dough in a crescent shape. What do you think? We have not done that yet, but it is a fun idea. I love your books and recipes and have given many of your books as gifts. I am a displaced New Orleanian and really miss traditional New Orleans style french bread (Po Boy bread) Do you have a recipe for it? Or a suggestion as to how I could modify one of your other recipes to achieve that unique loaf? Thank you. And thanks for making a baker out of me. I think the texture of the crumb is much lighter than our breads, but I will have to do some research. Rosemary: We haven’t specifically tested that– but, we have found that if your result isn’t great with a 20-min preheat, experiment with 30, 45, and 60-minute preheats and see if you get a faster result. These look amazing! Do you know if they can baked instead of fried? I was thinking of brushing olive oil around the outside and baking but I didn’t want to waste all the ingredients if it’s already been tried and didn’t work. Cissy: Haven’t tested, but should work? My best guess, anyway. Shape may be the issue (will not hold shape as well). I’ll give it a try and report back!